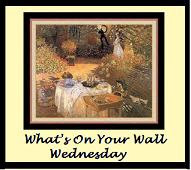 Welcome to What's on Your Wall Wednesday with our gracious hostess Barb at Grits and Glamour. Please be sure to stop by her blog to see her beautiful home and to find a list of participants! This week, instead of my plates, I would like to share with you one of my favorite artists. No, not this artist...although he truly is my favorite! 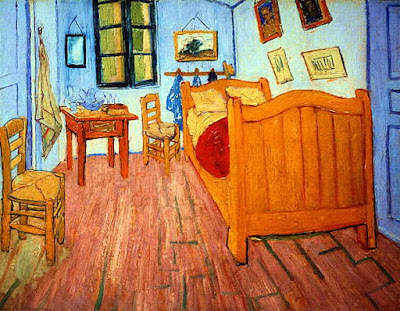 And this is my favorite painting, Vincent Van Gogh's Bedroom in Arles!! I love the way Van Gogh paints! I have this one on my wall. Meet Pete the Cat!! Do you see him?? Curled up on Van Gogh's bed??? lol Isn't he cute?? 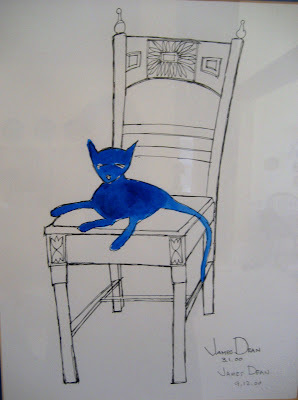 This is one of the signed Pete the Cat prints that I have in my living room. They were created by an artist named James Dean...no, not that James Dean...! He is a very creative Georgia artist who has quite an imagination. My Van Gogh's Bedroom Pete is just one in a series which finds Pete in quite a few paintings by the masters. Of course, I chose the frenchy ones! 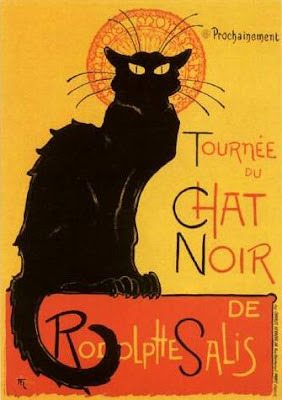 You must have seen this famous painting Le Chat Noir (The Black Cat) by Théophile-Alexandre Steinlen. This one is hanging in my hall, by the way! And here is the James Dean version starring Pete! It's called Chat Blue and I love the colors! He hangs out with my Van Gogh's Bedroom Pete! And this is my first Pete. I bought it in a little shop in Madison, Georgia, about 8 years ago. This is the one that got me started! Don't you love Pete? If you would like more information about him, or would like to take a peek at some of the other Petes, just go to Pete the Cat and enjoy! Thanks for checking out my post! Please be sure to visit Dixie at French Lique,Texas to continue your book tour! Love your walls! I knew you would have something interesting and of course you didn't dissapoint! Wow! I really loved your pictures! Now I've got to check out PETE! Hi Debbie! Thanks for stopping by. I am looking forward to meeting you on March 2nd too. The cemetery is in Rome, GA. It's called Myrtle Hill and it's gorgeous in the Spring time. I enjoyed your photos too! 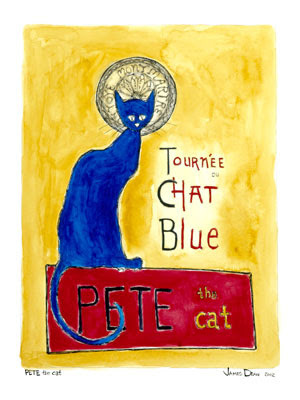 I love your paintings, and Pete is great, just love the black cat! I had a real one he is gone missing. I live in the country but just off a state highway. Some must have wanted him! He would only let Hubby and me pet him. I do wonder how they could catch him. I have two new baby chicks with Mama Hen (Diamond) There are so cute. Wish I would have went shopping while I stayed in Madison,Ga! We have a Madison here, and its a great, pottery, antiques shops, gift shops, antique malls. Lovely places to eat. Hi Debbie, I just love all your cats! I looked around your blog and your home is just lovely! I have truly enjoyed my visit tonight! Love Pete! 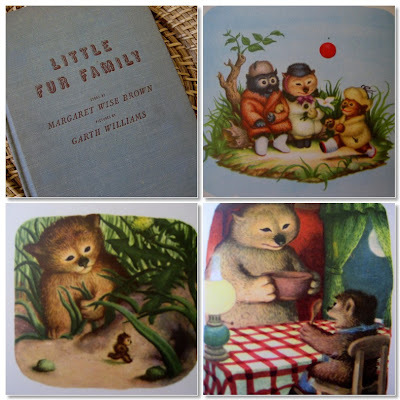 I sat and basked in the images you posted from the children's books...The Fur Family! Haven't thought about those dear characters in the longest time. 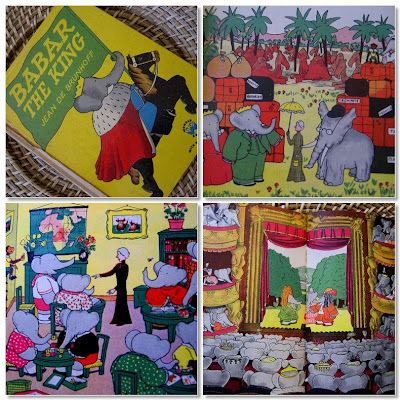 Madeline and Babar - I have all of those and love them too. Never tire of the classics! Oh I have always loved the Black Cat and Pete the Cat is a pretty cool dude, too. They are just perfect for a francophile cat lover. Very clever and as always, the perfect music to accompany the tour. Bravo! The childrens books are such a good choice--that's what we all started out with, right? 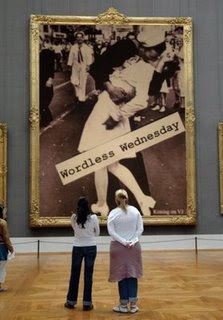 Thanks for stopping by my 1st wordless wednesday! I love childrens books! children books always my fave!.. and yours are just lovely.. happy wednesday! Debbie, I loved this post! All the pics and stories were wonderful! Loved your Pete the Cat post. I am partial to kitties, I must say. I'm going to check out the artist. These books bring back memories of childhood. Thanks for sharing! What fun art...love how he "posed" Pete in Van Gogh's bedroom! I did a cross stitch of Chat Noir and it was a lot of red stitches. Very nice post. You must love cats. I'll have to send your blog to my sister-in-law. Pete the cat is too cute!!! Love the books!!! Absolutely GORGEOUS photos. Who knew Books could be so pretty. You are a very talented lady. Hi Debbie. Your favorite painter Vincent van Gogh is my favorite too. My father was a connaisseur of Vincents work. He knew every painting and every book of him. He did collect paintings and I inherited quite a few from him. Not van Gogh mind you. LOL. We did sell a lot too as he had so many.I wanted to participate in What's on your wall Wednesday too but I don't seem to be able to. Will try again. I have plenty to show. Love your post today again. Hi Debbie, I loved the pictures of Pete. I love Van Gogh too. What a great post! What great pictures! They are just wonderful...and sooo appropriate for you and your staff of many. I love them! Your books are great too. 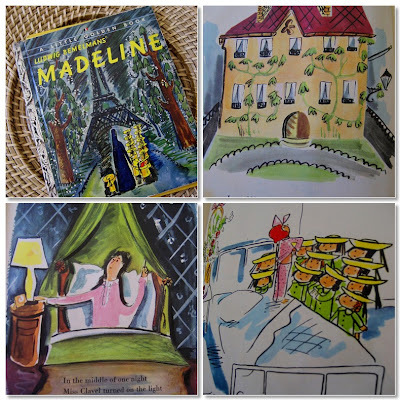 I remember Madeline...and I have my own granddaughter by that name now. Thank you for sharing. Come by I'm having a giveaway! 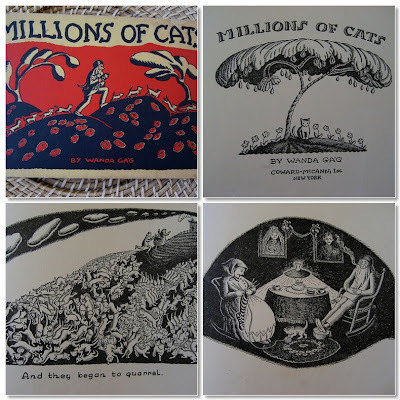 A wonderful post and thank you for introducing me to Pete, the Blue...such a long tail (tale?)! Clever to introduce him into the art of the masters. Van Gogh...I am always entranced by Starry Night. Your WW book theme is a delight, picking a book and putting pages together in one shot. Margaret Wise Brown wrote Goodnight Moon...did you ever notice there is a tiny mouse hiding on almost every page?? It's a bit like Blue Pete. great post! love your walls!!!! Pete the Cat is hilarious! But my, he has excellent taste in artwork! 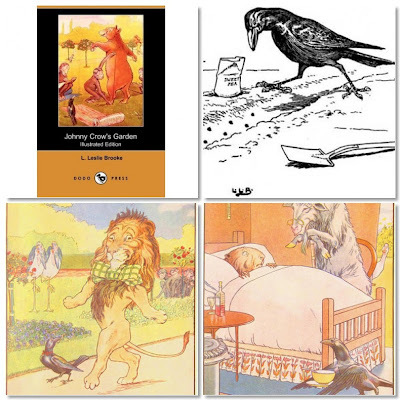 Great post, loved the children's books. Thanks! You have been one busy lady this week, no doubt about it. I can't imagine doing one post in a day, much less two. Both were totally delightful. I have to check out the link your provided, because I definitely want to learn more about Pete. You are so creative and entertaining but the most amazing fete is your precious kitty cat posing with the mask - how cute is that. I love your art and your music - what a package! I just finished visiting with Kathysue and she told me you two had collaborated on a post last week. Where have I been??? I hadn't seen it--so after our conversation I jumped into blogland and throughly enjoyed your current post as well as the one with Kathy's pantry. She did a great job on her pantry! You will have to talk her into posting pictures of her closet that she is working on now. Her house is amazing. I should refer to it as a home because that is what it is, filled with charm, elegance and the sweetest of all families! Debbie, I love all your paintings! Love the Van Gogh and how cool you were able to actually stand in the room!!! How have I missed Pete the Cat all these years! 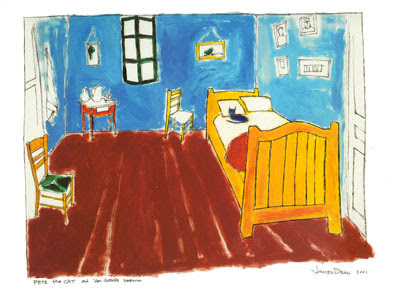 I hope to collect one of Dean's paintings one day...love the colors and the humor. Have a wonderful weekend and give your kitties kisses for me. Have a wonderful weekend and give all your kitties a kiss for me.